“WE’RE AN INTERNATIONAL ORGANIZATION CREATING TOMORROW’S LEADERS THROUGH SERVING OUR COMMUNITIES TODAY” A quick 30 second elevator speech can help nonCKI affiliated people understand your passion for service! When preparing yours, be sure to show enthusiasm for what CKI offers yourself and others. LIVE TO SERVE, LOVE TO SERVE As a service based organization, Circle K International values giving back to others. Our motto summarizes the spirit of the Carolinas District member. To be the leading global communityservice organization on college and university campuses that enriches the world one member, one child, one community at a time. I pledge to uphold the objects of Circle K Interantional, to foster compassion and goodwill toward others through service and leadership, to develop my abilities and the abilities of all people, and to dedicate myself to the realization of mankindâ&#x20AC;&#x2122;s potential. International Seal The CKI seal is our traditional logo. You’ll see it on official materials— pins, banners, the gong and gavel, certificates and awards. Use it on all of your official stuff—including T-shirts. Make sure our logo is clearly identifiable. Don’t crowd or stretch it! When resizing, do so proportionally. 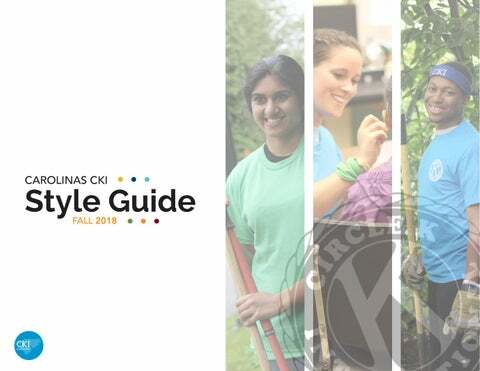 The District Emblem is integral to the Carolinas CKI brand. Its directness, smooth edges and unadorned type fit who we are: We are leaders. We are modern. We are Carolinas CKI. District Wordmark The District Wordmark is used to represent the Carolinas District with the recognizable CKI letter marking. Divisional Logos Beyond our International & District logos, our Divisional logos serve to represent the six divisions in the Carolinas District, and their respective geographic areas. They promote a sense of unity under the Carolinas CKI brand, while also allowing individual identity between divisions. Beyond our logo, color is the most recognizable aspect of our brand identity. Our brand colors reflect our bold, diverse community. 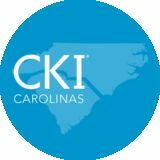 Using color appropriately is one of the easiest ways to make sure our materials reflect a cohesive Carolinas CKI brand. Typography plays an important role in establishing and reinforcing our brand. Our typographic identity reflects Carolinas CKI’s identity as a bold, forward-thinking organization. Capturing CKI Camera resolution Minimum: 1600x1200 pixels – 5.5 megs Best: 2400x3600 pixels – 24 megs Phone cameras often are not able to capture photos in high quality, but are able to capture images if there is no other camera available. For a single person photo bring the person closer to the camera. Zoom in with your feet! Make sure the background is not the focus of the photo. Make sure the subject is standing in the best light—beware of shadows. Try to use natural lighting whenever possible. When taking photos try to capture expressions or actions. Focus on the face— capture a larger image. Avoid shooting headshots. Advertising You do not have to be a professional photographer to capture your club’s best moments.Use the following guidelines to help you take better pictures! Save the filters for Instagram! When sending in photos please be sure to send in the original photograph.